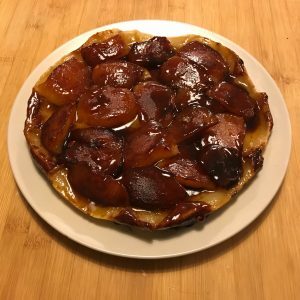 Tarte Tatin is a puff pastry apple… tart (well yes I guess, but is “tarte” the same thing as “tart”, no right?)? Pie? Cake? Something. It was invented by accident at Hotel Tatin in France, and thank the lord for accidents. I’m not really sure exactly what it is about it that I like so much. 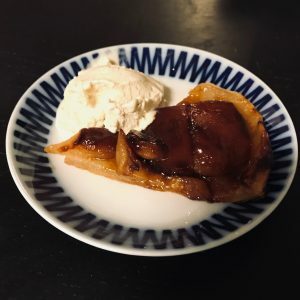 I am a bit of a sucker for apples in desserts (I’ll be back with an even better but also a bit more complicated cake in a while) and there’s just something with the apple & caramelized sugar combo that’s… lovely. It’s sweet. Maybe too sweet for some. Hanna (my girlfriend) thinks so, but she’s very sugar conservative. I might be a liiiittle bit wained off sugar but I thinks it’s right on the border, despite my recipe having quite a lot less sugar than other ones I’ve come upon. It depends a lot on the apples as well for sure. 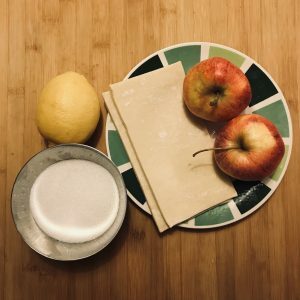 I recommend you to use quite sweet as well as not too sour apples, which might sound a bit counter productive when reading the above, but I think it fits best for this dish. So how do you make this bad boy? Easy. 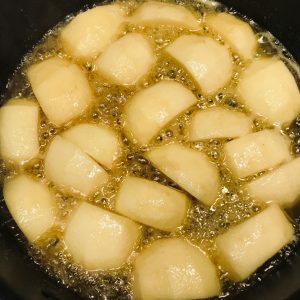 You just pan-fry the apples in butter, sugar and lemon until the sugar starts to caramelize. Then you cover the the contents of the pan with puff pastry and bake it in the oven. When it has cooled down outside the oven you flip the pan upside down over a plate and out comes this lovely thing. I tend to think that it’s ok to buy the puff pastry. The store bought one is mostly pretty good and it’s a bit of a chore to do it. Best eaten with vanilla ice cream so I’ll include a simple recipe for that as well. Mmmmm. Cut open the vanilla bean, scrape out the seeds and put the together with the emptied bean in a pan. When the milk-cream mixture reaches a light simmer, take it off the heat and let it rest while continuing to step four. Gently whisk the sugar (70 g, ca 0.8 dl) with five egg yolks. Pour the vanilla cream-milk-mixture into the sugar-egg-yolks while whisking. Add the mix back into the pan and heat it slowly up to 84 C, while stirring constantly (a flat wooden spoon scraping the bottom of the pan is ideal). When it reaches 84 C, take it off the heat (important to not exceed 84 C, but if you want to stop at 82/83 C, that’s completely fine). Pour the batter into a bowl and put it into the fridge. Now the ice cream is ready to go into the ice cream maker. If you have a fancy ice cream machine (active cooling), you can put the warm ice cream batter straight into the machine.If you have a less fancy ice cream maker (freeze block cooling), you’ll have to wait for the batter to get cold before putting into the ice cream maker, otherwise the warm batter will heat the freeze block too much, and the ice cream might not get the proper consistency. Put the oven on 200 C.
Peel the apples and cut them in four or six (or something) pieces. Heat a pan to medium, add the butter (75 g). When the butter stops sizzling, add the apples. Squeeze the lemon into the pan and add the sugar (75 g, ca 0.9 dl). After a couple of minutes, lower the heat to low/medium and let the apples fry until the butter caramelizes (gently turning them ones in a while). 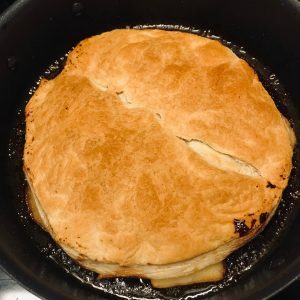 Let the apples cool off the stove for five minutes (but still in the pan), then cover the apples with puff pastry. Put into the oven for about 15-20 minutes. 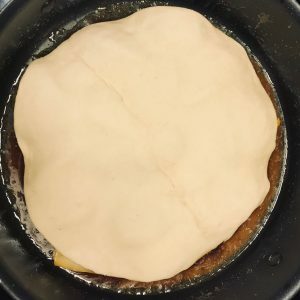 When done, flip the pan over a plate. Beware of hot caramelized sugar dripping on to your wrist when turning the pan. Let it rest for a while and serve luke warm. Making Tarte Tatin is really very easy. 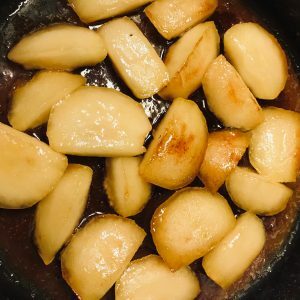 You might have different preferences regarding how caramelized the sugar should be, how much lemon to use and so forth, but I think you’ll be happy from the first go. If you want to get adventurous later on, try mixing the apples with pears or even parsnip(!). Making the ice cream might seem a bit involved at first but after a while it becomes second nature. It’s really worth getting comfortable with this. Whipping up some home made ice cream is a real home run and this basic recipe is the starting point for all cream-based ice creams.